These words are going hand in hand more and more as Uber revolutionalises the transportation industry. Uber is a game changer. How easy is it now to get a paid ride when you want from where you are to where you want to go, without having to battle with a taxi company? Now, there is no worrying about finding a ride when taxis are doing 3:00pm changeover shifts? And gone are the days of not being able to get a cab to come to your home to pick you up, and then walking ten minutes up the road to the railway station to find a bunch of cabs sitting there waiting on a fare…. No. The world needed Uber. So, let me tell you about my experience recently the other week when I was out one night in Atlanta. Firstly, as you all know, I’m not from Atlanta. So what happened this night was that I decided to venture out for dinner about twenty-three kilometres from my hotel to a restaurant that had been highly recommended to me. I decided to travel by Uber both ways. On the way there I needed to sit up front with the driver so that I could recharge my phone. And guess what? The driver was able to oblige my request with ease. Now, after dinner, I needed an Uber to get back to my hotel and here is what happened. I ordered the ride, but the ride never showed. What happened was, that I think he did in fact show, and I saw him, but he was six lanes across a major road from where I was at, and I was in a driveway on the other side where, as a matter of fact, plenty of other diners were being collected by other Uber drivers. So after a while of watching this on the app my driver went and cancelled the fare and Uber billed me six dollars. Immediately I proceeded to order a replacement ride, and within minutes the new driver had arrived to where I was and I was on my way. So on this ride, I mentioned to the driver that I was staying out near the airport, but after a few minutes he pointed out to me that our destination was logged as Marietta which was in the opposite direction. So the driver immediately switched route and turned the car around, despite the fact that I was having difficulty changing the destination on the Uber app on my phone. Well it turned out that the driver needed to leave the highway to put gas in his tank, and so while we were stopped there he was able to help me find the right place on the phone app to load in the new destination. So how did this little error all happen? Well the Uber app lists three recent destinations as buttons on your Uber destination page when you go to book a ride, which is very convenient. Similarly, when I went to ride to the restaurant, there is a “Ride with Uber” button on the Trip Advisor app that took me straight to Uber without me having to type in the destination. So I figured it was entirely my fault that we were travelling in the opposite direction initially, because silly old me, I hadn’t paid attention to the detail. To cut a long story short, my driver dropped me at the correct hotel, and collected his correct fare. Sure, the fare was probably a little higher than if we had gone straight there from the restaurant, but heck, that was all my fault, and none of this driver’s fault. In fact, he was very pleasant about it all. What was really interesting, was that in the initial part of his ride I was putting in an objection to Uber about the driver who cancelled the first fare. Because Uber had charged me $6.00 for that. Well after logging my objection, Uber immediately sent me an email letting me know that the $6.00 had been refunded to my card. Firstly, in the case of a dispute, the best form of resolution is concession. Really, for $6.00, why not? $6.00 is a very small price for Uber to pay [back] to ensure a happy customer. Secondly, as in my case, sometimes the customer messes up. I did. With the second ride home and the incorrect destination. I skipped a step, and relaxed my attention to detail. No real harm done, but no point arguing about it. Great customers make for great business. Try to encourage your customers to be great customers. And not nickel and dimers. Try to work out how you can apply these two lessons into the day to day running of your business. There are always plenty of lessons out there in front of you. You only need to see them, heed them, and take action. Are You Measuring The Wrong Stuff? Are you measuring the wrong stuff in your dental office? Are you measuring at all? A recent posting on a dental chat forum reminded me that sometimes as dentists we can get hung up measuring the wrong things that don’t need to be measured. I say this, because years and years ago I remember talking with a young dentist who felt that his employing dentist was making him collect and record data measuring things that made “not one point of difference”. And I know even in my own office, at times, there were times where my team stopped recording information required on a daily basis because they felt that I was not reviewing that information so much. The thing about recording information is purpose. What purpose will this collected data serve? Some data is recorded for daily checking, while other data is needed to determine future trends and forecasts. And just because something is not reviewed on a daily basis does not mean that once a month, once per quarter or even longer, that someone is not going to sit down with that data and do something with it…. As I said, this posting that I viewed online was a question that was directed at collecting data that the result of would have no benefit at all to the office except in providing a number only. I responded asking for further clarification, simply because I thought that the end answer “How many hours a week?” was dependent on a number of factors that would vary depending on the office? The doctor then replied with something really interesting, which was that he had a number in mind of time spent per patient, and that he had then multiplied that out by the number of operators in his office [a specific number] and then by the number of patients seen per day per operator [he provided a very round number here], to arrive at a number for the total hours per week spent scheduling. It looked as though this doctor was looking for a number and not really looking for a result. This is a really interesting factor and I see this time and time again in dental offices all around the world. If the dentist and the dental assistant pre-frame the importance and urgency of the next appointment with the patient while the patient is in the treatment room, then the front office person has a considerably easier role in scheduling the appointment than if the patient is just sent back up to the front “cold”. I see dental offices where “cold” patients arrive at the front desk with absolutely no idea of what’s going on, and guess what? The front office employee really has no idea either because they weren’t in the treatment room to see and hear what went on beforehand. This system, and I use that term very loosely, has become more common in dentistry and is due to the reliance of automation in the office. is a phrase destined for difficulty and failure to follow. Anything that reduces verbal communication in the dental office increases the difficulty of future scheduling dramatically. It really depends on their nature and their roles? “Is the dentist a waffler? Or a “D” type? A proper pre-frame and a proper handover in the treatment room will make the job of scheduling for the front office person so much easier. The result I was talking about, of course, is securing an appointment. Some front office employees are very social and very friendly, but they lose sight of the fact that it is their primary role to ensure that every patient leaves with an appointment that they are totally clear about. Because a confused patient cancels their appointments. Which tooth or teeth will be treated next time. What will those teeth be having done? What will happen to those teeth if the treatment is not carried out in the time frame recommended. “The end result is not how much time it takes to schedule an appointment, or a week’s worth of appointments. An appointment cancelled or not kept quickly negates any minutes and seconds saved in hastily scheduling that appointment. If I was having a surgical procedure in hospital, I’d want to make sure the surgeon did the best job he could, ending with the best result for me, the patient. Time taken per operation is not a thing I would consider when choosing a surgeon. Similarly, when I coach dental offices, I’m looking at production and kept appointments. And how few appointments are cancelled. The salary of a great front office employee who gets it right no matter how long it takes is always a great investment compared to the lost production of one wasted appointment that is made and then cancelled or not kept. I recommend not bothering to measure time taken to schedule an appointment. If you are going to talk to someone, then make a concerted effort to use their name while you speak to them. And use their name regularly. Everybody loves to be recognised. And by using their name, you show to your customer that you respect them, and that they are important. Conversely, not using someone’s name, and not making an effort to remember their name, is a distinct act of disrespect. Recently while travelling to the USA, I visited the American Express Lounge in Dallas Fort Worth airport. When I was greeted at the entrance after showing my Amex card and boarding pass, the lady on the counter made a significant effort to remember my name and to repeat it back to me. In fact, even after ninety minutes, when I left the lounge and headed to my plane and departure gate, the same lady farewelled me personally by name. Did that make me feel important? I’m telling you, yes, you bet it did. Make it your purpose to remember the names of everybody who you deal with. Learn their names and use their name back to them often. The Quick Short Buck Or The Long Slow Buck? You Choose…. Dentistry is a really weird business. Because, as a business owner, you can have two types of businesses in dentistry. And with that, there are usually two types of customers. So you get to choose. You get to choose which type of business you want to be operating. You get to choose which sandpit you want to be playing in. There’s the quick buck and there’s the slow buck. The quick buck is here today and gone tomorrow. The slow buck is here today….and it is here next year, and the year after, and the year after, and the year after. Which sort of businesses of these two models do you think would be more sustainable? In 1987 when I bought my dental practice I decided I wanted a long term sustainable business. And were happy to have all treatment that they needed, as it was diagnosed, because of their undying trust and belief in me…. And that’s the business I built. In the next twenty-eight years I took that dental office from a turnover of $140K pa in 1987 to a turnover of $3.6M in 2011. That office grew from a team of me plus one to a team of me plus several, including two other full time dentists, three other part time dentists, three hygienists and seven full time auxiliary staff and two other part time staff. The business grew from one operatory to seven operatories over two locations. Look for the long tail. Don’t look for the quick buck. Look for the long-term patient. Build trust and you will build a business. A trusting customer returns and spends again. And again. And again. If you only look for the quick buck then you are always going to be looking for a replacement customer for the one you have just served. I was always looking for the long term motivated customer. I was always looking for the patient who wanted to do what it takes to keep their teeth, NO MATTER WHAT, and were willing to commit to that chosen path. This meant regular hygiene visits for them. We always encouraged our patients RELIGIOUSLY to schedule and see our dental hygienists without fail through hell and high water no matter what. This showed our patients that we were interested in their long term with regards to their mouth. We wanted our patients to know that a solid foundation was necessary for long term dental health, and that that foundation begins with the dental hygienist. In fact, as a dentist, I WAS NOT interested in seeing people who would NOT commit to the hygienist. What was the point of that I thought? Why would they try to even pretend they were committed to dental health if they were not committed to a regimen of regular and necessary dental hygienist visits? Any visits or patients that “smelled” like a one-time-only type of treatment were not what I was seeking for my practice. There was no way I ever wanted my dental office to be seen as a “convenience” or worse still, a “commodity” within my community. Don’t get me wrong, though. I was always happy to provide EXCELLENT service to single visit patients. But I never was in the business of encouraging “Price Competition” for business. When I visited the USA last June this phrase was the cliché of the month…..it was everywhere. And really, it is appropriate in this situation. My fees for all procedures were set way in advance of daily catastrophes and fluctuations. I never discounted my fees. I know some dentists who openly discount their fees to patients without ever being ASKED for a discount. And I know other dentists who wilt like a dehydrated lily and concede a discount to every patient that even questions their fee. Firstly, it tells the patients and your team that you believe your own fees are too high. Secondly, it tells the patient and your team that if you could get away with it, you would charge this higher fee. And thirdly, it tells the patients and your team that you yourself do not see value in your own fees. All discounting does is cheapen you, and the profession. I was never a big fan of chasing the latest fads…. Orthodontic aligners? That’s a fad. The problem with attracting whitening patients and Orthodontic aligners patients is that they are very much wanting a one-stop process. They are in and they are out. And off to the next quick fix…..
Take a look at your books and ask yourself this question? Did all, or any of those whitening and Orthodontic aligners patients bother to stay around for hygiene or for long term restorative, AFTER you finished their initial treatment offer? Offering whitening and Orthodontic aligners to your existing patients is certainly an option. But in hindsight, using these services to attract new patients only served as “fire sale” material when we looked at total collections in my dental office. 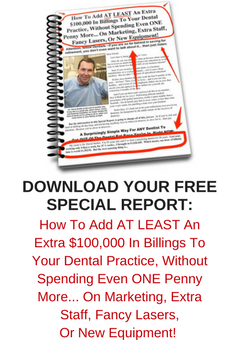 When you offer these two products as a means of attracting new business in your dental office, you soon end up in a price war with your fellow dentists in an effort to create a competitive edge….and being the biggest discounter, or the cheapest dentist, is not a very good business strategy. Provided you can deliver consistent great service there is always going to be a client or customer who is happy to pay your prices and does not care at all about what your competition is doing or charging, because to them [your customer] you represent excellence. And these types of customers make up between 20-25% of the population. Whether we are talking lawn mowing, pool cleaning, hairdressing or restaurants, there will always be 20-25% of the population who are loyal to their service provider and do not care what the opposition is charging. The problem is, some businesses are not confident or happy to be playing in a pool where only 20% of the population is. Those businesses feel more comfortable fighting it out for a thin slice, or a scrap, of the larger competitive price conscious market. Because those businesses are worried about volume. And they confuse activity with achievement and accomplishment. There is no point being busy doing unprofitable things. That’s a tough life to lead. Have You Got One Arm Tied Behind Your Own Back? One of my dental coaching clients has recently, in the last twelve months, morphed her office from being a high-volume Medicaid patient office to now being Medicaid free. Actually, I think she completed this task in eight months. How would you feel having to transform your business in such a short time? And what do you think would be the results of such a transformation? A couple of years ago I told you about a dentist friend of mine in USA who sacked more than half of his dental patients and concentrated only on seeing the patients that he liked to see for the dentistry that he liked to do…. How do you think that transformation went? In both cases, the dentists have ended up seeing fewer patients but have ended up with dramatic increases in collections revenue. Both of these dentists have come to the realisation that the answer is there in the WHAT that you do rather than being there in the HOW MANY that you do. In the case of the first dentist measured, she has just now closed off the books for a calendar month which has been a practice record in terms of collections. And this despite the fact that she is now seeing fewer patients. You see, she is seeing more of the right sort of patients and far fewer of the wrong sorts of patients. This was the same for my USA dentist friend who reorganized the type of work that he was doing and concentrated on the type rather than on the volume of work. In his case, collections rose over three hundred percent!! This is not just a phenomenon exclusive to dentistry. Recently I heard of a [non-dental] consultant working with a client whose average spend was $300.00 to acquire a new customer. The consultant wanted the client to target a specific type of new customer, but the average spend forecast for this new campaign was going to be $900.00 per new customer. Needless to say, the client had a conniption, bit the consultant was able to persuade the client to “dip his toe” and run the campaign. New clients as a result of the new campaign, had an average initial spend of $8500.00. And the lifetime of all customers for this business was traditionally a four-year period, so there was considerable upside to the new campaign. Apparently the client persisted with the new campaign, but somehow couldn’t bring himself to come to grips with the fact that he was spending now three times more than he previously had to acquire a customer, despite that customer being considerably more valuable for very little overhead increase. And so the client morphed back to his old self…. Is there an imaginary line in the sand, an invisible glass ceiling that you are imposing on yourself that is weighing you down and preventing you from leaping forwards and transforming your business into something dramatically better than you had ever imagined? We all need a helping hand. Imagine how many poor decisions you’ve made to not do something, and how different things might have been had you done them?